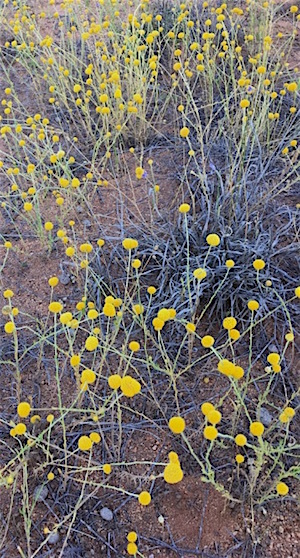 A small Landcare group in the Old Eastside has proved that buffel can be beaten: After years of effort – absurdly some of them spent on obtaining permission – several hectares at the base of Spencer Hill are now a sea of yellow billy button flowers. What’s more, the effort is proof that selected areas, including our major tourism assets, can be restored. Parks & Wildlife, under Minister Bess Price in the Giles Government, had all but thrown in the towel. The Eastside effort – which is ongoing because after rain new plants need to be dealt with – has been spearheaded by Sue Morrish and Rosalie Breen. Ms Morrish says the effort began in 2007. 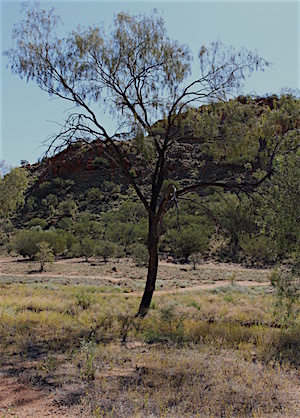 “We had to get approval from the Aboriginal Areas Protection Authority (AAPA, as Spencer Hill is a sacred site), Department of Lands and Infrastructure, and needed to become an incorporated body for public liability purposes – this is why Alice Springs Landcare was formed,” she says. Many people told the group they were on a mission without hope. “That’s why it is so rewarding that we kept going,” says Ms Morrish. The main method of control was spraying Roundup at times when the plant was growing vigorously, after rain. Buffel burns very hot, killing native trees that can survive “cool” fires of native grasses. 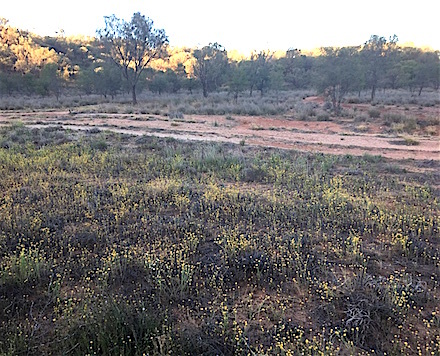 Buffel – declared a weed in South Australia but not in the NT – displaces native plants which are now coming back to Spencer Valley: bluebells, swainsonia purple peas and golden everlasting. The Landcare volunteers mostly use spray backpacks, but also mattocks and Landcare’s trailer-mounted spray unit, towing it behind Ms Morrish’s car to various spots in the area and using two spray hoses to go from plant to plant. She says last year alone 695 litres of Roundup solution (usually mixed at 1 to 100) was used and volunteers worked an estimated 200 hours. PHOTOS: Billy button flowers. The grey clump is dead buffel • Part of the treated area. In the background, on the other side of the track, buffel still reigns supreme. 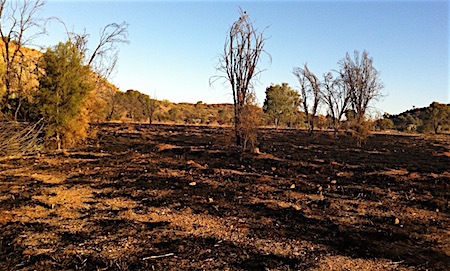 September 2012: Trees killed in buffel fire. Eight St Philip’s community service students have been working on eradicating and managing dense areas of buffel and coral cactus in and around the Telegraph Station, Spencer Valley and the college grounds (photo below). 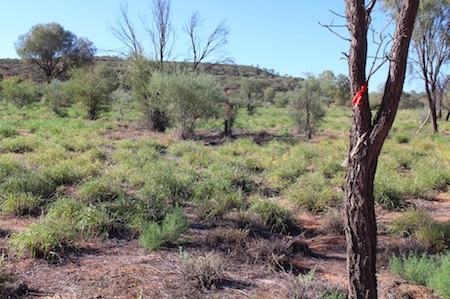 “That will give native grasses a chance to grow and reduce damage to trees during bushfire,” says the college. The group is a finalist in the Natural Resource Management Awards. @ Collins: Please have the guts to put your name to a comment; may be I wrote stupid things, but at least I sign for them. @ Craig San Roque: Very good, but it is not everyone who can do same, may be for reasons of health or work commitments. However, may be everyone could control their footpath to avoid the seeds to be transferred far away by winds a major mechanism of dispersal of buffel grass seeds. It was helpful to read all those comments on poisons and methods and hope … and big pictures, but when it comes down to it, all I do most mornings around 6.30am is go out through the back gate into the Coolabah Swamp with a hoe or mattock and a dog and chip out a buffel or two. I don’t argue with the dog, I don’t instruct the buffel. I don’t see anyone else, much, doing so. In a population of 24,000. Great to see volunteers who care enough not to wait and watch our native plants and animals disappear. Whether you choose hand removal or chemical spray, it all takes effort. The key is to act strategically so that regeneration is as far as possible self sustaining, and the value of your work maximised. Gosh Janet. Are you incapable of just saying job well done? Read the other responses, you might learn something. Peppering???!! I foolishly wasted 30 seconds of my life reading that article. @ Hal Duell Here is the link you requested. @ Evelyn: Pine oil is also being used widely as an organic herbicide that breaks the cell walls of seeds. This is being used in areas where organic beef producers are concerned about the impact on their organic classification. Rod Cramer suggested at the SA Buffel Forum that we need to have a political plan and political leadership on the issue of buffel grass. The most effective efforts in Australia to date are in SA. Unfortunately the resources have wound up for the coordinator position but the collaborative spirit of the taskforce lives on. Here in Alice Springs we need to get the heads together and have targetted blitzes at the right time. Alice Springs Town Council and the NT Government providing support for volunteers to get in and clear it. People with maddocks and hoes, and others with spraypacks, where allowed and we need to beat the buffel back in areas that we value. Olive Pink Botanic Gardens, Alice Springs Desert Park, Desert Knowledge Precinct and any number of the hills and other areas of high value. It’s one thing to walk together, it’s another to work together. Also, from http://gmo.geneticliteracyproject.org/FAQ/where-are-gmos-grown-and-banned/ – Genetically modified crops are grown in 28 nations around the world, while nearly three dozen nations prohibit or ban their cultivation. GMO bans received considerable attention in 2015, when a majority of the European Union nations decided to block the cultivation of new GMOs within their borders and Russia issued a ban on both cultivation and imports. As in so many things in today’s world, it seems Russia is leading the way. Why anyone would purchase soya products not certified organic boggles the mind. 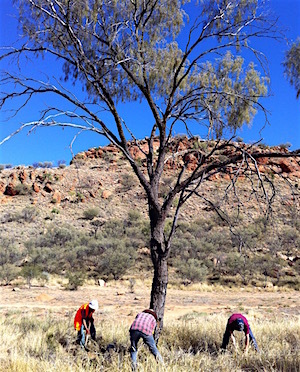 Great work Landcare Alice Springs – Spencer Hill Special unit. Topically applied the risk is much reduced. While not an avid supporter of spraying, the results coming out of roadside sprays in SA and the dedicated work of the Buffel Taskforce demonstrates the positive impact that collaboration of people and groups can have on this ecologically transforming weed of the arid zone. The people of Arizona also provide inspiration in their buffel busting efforts to protect the sagura cactus of the sonaran desert. Closer to home and not involving spraying is the tireless efforts of Buffel Warrior Bruce Simmons who has cleared around the community garden and built most of the soil there through composting the buffel with cow manure. It works a treat. Have just returned from SA buffel forum along with a number of Alice Springs residents involved in buffel control. Inspiring forum and a working group to pursue a biological control has been formed. Thanks to the Alice Springs News for covering this important ecological issue. Out of town the wild flowers are prolific with bloom and all alongside buffel grass. And all without polluting the group with chemicals. Dare I say it is all environment and clean. Wow, who would believe it? I use Roundup sparingly to control kutch (couch? ), but have residual worries. What happened in Argentina? Can you provide a link? Great to see this story and for the volunteers to get some acknowledgment of their effort. Spencer Valley is now a credit to all who have spent time controlling buffel. To be fair to Parks, I believe that they are doing some work to stop buffel invading sensitive areas. The cost of manually fighting buffel on a broad scale is huge. Research into technology for buffel control is urgently needed. A first step would be a drone that can quickly map clumps of buffel to save the time consuming search for it on foot. This should not be difficult with existing technology. 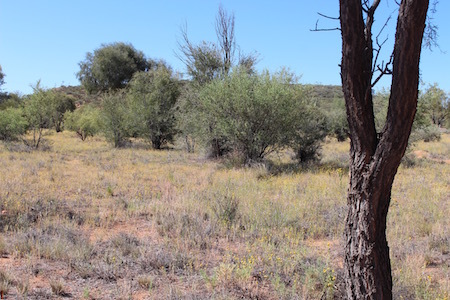 Anyone who has been in Central Australia for a little while can see the devestation and displacement of the native species caused by the ever spreading buffel grass. It is a serious issue that must be addressed. Erwin, thanks for running this story. Readers might like to know that the same thing is happening in the Coolabah Swamp / Ankerre Ankerre. A handful of local land care people under the watchful eye of the local TO family are clearing back buffell and invasive saltbush (originally planted for dust control in the 1970s). Look around the Sturt and Stott Terrace corners and back of Mueller and Lindsay Avenue. You will see the clearing and new growth. Once upon a time the Coolabah Swamp was overgrown, trashed and seen as wasteland. Now, with the support of the group it’s safe to rest and walk though some of it. Anyone can see how its getting to be a happier part of the fertile native bush spaces of Alice – like Spencer Hill – and some of the riverside. Maybe next on the list would be cleaning up the buffel from the heritage site of Billy Goat Hill / Alkeyule. Take a walk up there and see for yourself.